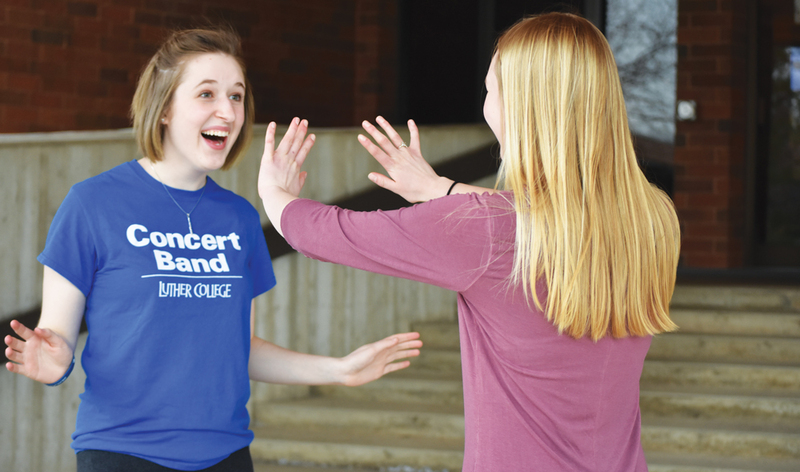 Alexis Olson (‘20) and Erin Haefner (‘20) practice alternative medicine techniques. Kathy Salazar (’17) created an Alternative Medicine club with the help of Doctor David Gehling from Decorah Chiropractic in hopes of providing students with information on alternative medicine. The club had its first meeting the week of April 12 and meetings will continue into the next year. Alternative medicine is defined as therapies and treatments that are implemented as substitutes for other mainstream medical therapies and treatments. Students involved in the alternative medicine club will study these therapies and treatments scientifically and academically. The alternative medicine club is lead by both Salazar and Gehling. Gehling will teach students about different kinds of alternative medicine. As a certified chiropractor he brings a professional view on alternative medicine. The alternative medicine club will meet approximately twice a month. The first meeting is going to be lecture-based with guest speakers and seminars from Gehling. The second meeting of the month will be a hands-on learning experience with alternative medicine. A January term class for first-year students allows students to explore the world of alternative medicine. Students, such as Alexis Olson (‘20), learned how to reverse a human’s natural energy, how to use herbs to help remedy illnesses, and different points on the body that can be massaged to counter chronic pains. One of the techniques Olson learned in class is reversing someone’s energy. Similar to the class, the club will give people an introduction to alternative medicine and how it can be used in everyday life. Those who attend club meetings will research and experiment with the scientific aspects of alternative medicine. In other parts of the world, these alternative medicine practices are commonly used in everyday life. Current members were drawn to the club for many reasons. Another focus of the group is to help medical students to expand their knowledge of different treatments, therapies, and remedies outside of the traditional methods. These include home remedies that are easily accessible to all people. Salzar hopes the club will help make Luther a more diversely educated community. “Not only will this club be super helpful, especially to college students but it can help people find other career options through the club,” Salazar said. Items such as acupuncture, chiropractic practices, cleansing diets, holistic healing, spiritual healing, herbs and oils, and meditation can all fall under the category of alternative medicine.